When it comes to cooking up a storm at home, a Zanussi cooker is sure to meet all your cooking requirements. Our range of Zanussi cookers feature a wide range of different models including duel fuel cookers to accommodate the cooking demands that come hand in hand with busy family life. 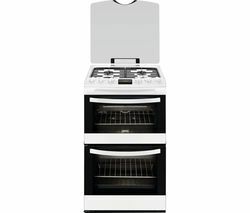 Ideal for small and large family homes, all Zanussi cooker models in this collection feature a number of high performance features, including double ovens with integrated grills and responsive ceramic hobs. They also feature Thermaflow fans to distribute heat evening throughout the cavity, so you’ll be able to achieve exceptional cooking results when cooking your favourite dishes. Offering performance, efficiency, style, and plenty of space to accommodate large family meals, with its cooking versatility and easy-to-clean enamel interior, a Zanussi cooker is sure to become a welcome addition to your home. Ergonomically designed for smooth and seamless operation, most of the Zanussi cookers in this range also feature user-friendly controls, LED indicators, and quick access, adding even more convenience to the cooking process. 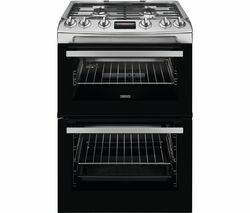 Popular models in this range include the Zanussi ZCV66030XA Electric Ceramic Cooker - Stainless Steel and the Zanussi ZCG63330XA Gas Cooker - Stainless Steel & Black. Check out our entire range of cookers, including Flavel, Logik, Bosch, Beko cookers, and more.